Bohol-Philippines.com is the contribution to Bohol travel by the brother and sister tandem of Elmer Anthony Olaer and Ellen Marie O. Buno. Born of two full blooded Boholanons, our Dad hails from the Olaer clan of Guindulman while Mom is a Hormachuelos from Mahayag, we truly love Bohol and try to convey that enthusiam into our website. Bohol is very much still a developing tourism destination. The international airport is being built and soon a lot of international hotels and resorts will be coming to this island. This is a very young website and will continue to grow thanks to the help of many people, government and institutional groups. We need your feedback. Please feel free to tell us what types of information you would like to have available. 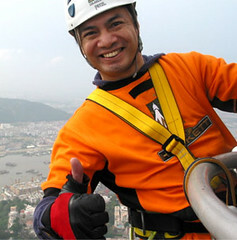 Elmer is the the director and webmaster of Bohol-Philippines.com Currently based in Macau, he is able to supervise the site thanks to Site Build It system. Ellen Marie O. Buno is the General Manager of A1 Online. She does most of the research and writing about Bohol and the islands' attractions. She lives in Talibon with her husband Edgar and their six kids. Again, thanks to the SiteBuildIt system, she can supervise the site right at home, from the beach or even in the mangroves. :-) Really, have WIFI will SBI. Bohol-Philippines.com attracts a lot traffic from the Philippines and international readers. We receive over 15,000 visitors and 50,000 pages read in January 2009 alone. This traffic is expected to increase exponentially this year. Bohol-Philippines.com offers webdesign using the following Site Build It and xsitepro systems. We can also do wordpress and joomla installations optimized for search engines. We also offer organic search engine optimization and link building services. We help our clients rank higher and generate targeted traffic. The SBI Action Guide is the actual guide you will use to build your online business. It's a great way to evaluate SBI before making a purchase. Highly recommended to go through it before deciding. There are people who work for SBI, from Al the Graphic Guy to Jim and Judd, who answer questions by email and many others. And then... there are the SBI forums, chock full of fellow SBI users who volunteer their time to answer questions, offer tips, and critique your SBI website in a warm, friendly and wonderful way. "Pay it forward" is the culture on the SBI forums, and it's not just rhetoric. It's real. Make Your Content PREsell. This is a great book written by SiteSell (SBI) president Ken Evoy. Now free! Make Your Site Sell is now also free. Described as "The Bible of Internet Marketing" this was the book by Ken Evoy which evolved into Solo Build It. Questions? Get the answers you need here.